The First Time in Burkina Faso I Almost Died (According to No One Except Me) – Keleng « Why did you click here? Before I left to go to Burkina Faso with the Peace Corps, I figured there was a 2/11ths chance I might meet an untimely demise while there. This was based on absolutely no legitimate math or rational information whatsoever, as I had rarely met a fraction I could comprehend, but a number I kept in mind that was just low enough to avoid any justification to back out under concern for such pretexts. Fast forward to three months later. I had completed our three month training program, and affecté (sent) to my site. I was replacing a married couple in the southwest of the country in a small town known as Sideradougou. However, that couple had left Burkina six months prior, and by the time I arrived in the house I was to be living at, the lack of cleaning over a the past half year in a place where things get very dirty, very quickly really showed. So I spent my first day entirely cleaning up the joint, and then again on the second. It was not exactly glamorous, nor involved saving babies from endemic cholera on an hourly basis as I had imagined, but it had to be done. However, there was another reason I spent two days cleaning, two more days that I had ever cleaned anything in my entire life combined prior to that. After three months in Burkina, I had become somewhat accustomed to the culture and country. However, during training, which was located on the north side of the country far away from my current posting, I was always surrounded by other volunteers. We split off into small groups of 4-5 where we did language training all day, then came together every 10 days or so as a big group to do more technical training. It was easy to go around and explore with others by your side. Being dropped off in village and realizing you were all alone for the first time in three months was a daunting feeling. So cleaning in some ways kept me occupied, and delayed the process of exploring my village on my own. However, I couldn’t handle a third day of cleaning, no matter how much I dreaded the first time leaving my house (in addition, given my lack of cleaning prowess and the rapid rate of dust resettlement in Burkina Faso, things were unlikely to get any cleaner. Ever). So on Day 3 I resolved to get out and explore. I didn’t really know what to do, but I figured maybe buying some vegetables would be a good way to ease in to village life. This was another first for me, as I had eaten about three total vegetables in my life to that point (two of them were potatoes). 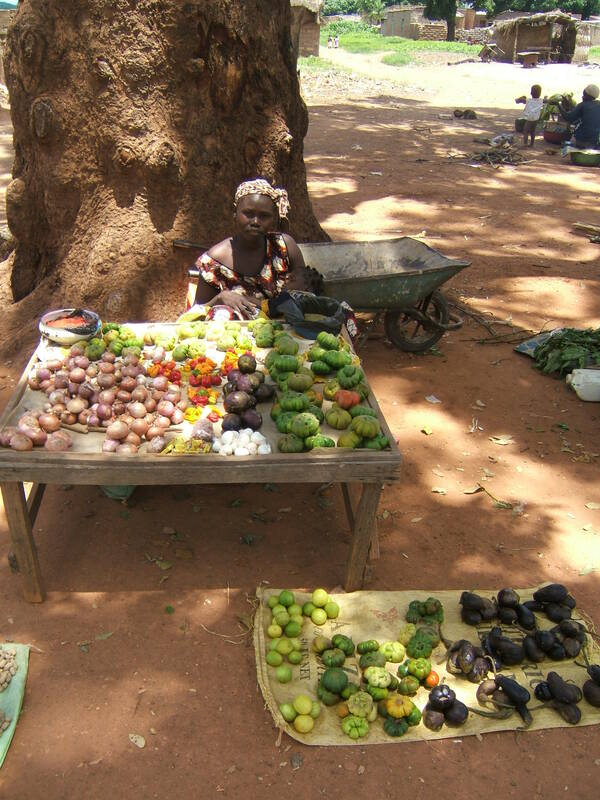 Between all this cleaning and vegetable shopping, Burkina Faso was domesticating me at a rapidly unexpected pace. It wasn’t market day, but my neighbor told me there were a few stalls along the main road. So I quickly reviewed my local language (Dioula) greetings and headed out that way, my first big trip in little Sideradougou. I walked at a brisk pace and could feel everyone’s eyes on my every move. I was really the only foreigner around, and this was my first foray out – I’m sure everyone was curious as to what the new guy was going to do (I carried similar questions). I tried to greet a few people by but clearly messed it up. They politely tried not to laugh and responded, but I could tell (saying Aw ni tile [good afternoon] when it was instead time to say Aw ni sogoma [good morning] is apparently a classic Burkinabe joke). Oh well, at least I wasn’t cleaning. After about 10 minutes I reached the main road. I thought there had been a lot of people I had passed already, but that was nothing compared to the amount hanging out on both sides of the road. And every single one of them was staring at me. Or so I felt. I walked up slowly surveying the scene as I didn’t even know exactly what to do, and wanted to avoid looking awkward and confused (likely 14 years too late on that one), or at least minimize that as much as possible. Luckily I saw a lady by a stall selling tomatoes out of the corner of my eye. Perfect I thought, tomatoes are a vegetable, right? If I just do something normal and get me some tomatoes, then maybe everyone will see I am just like them, that I eat vegetables too. I approached the lady and attempted to ask how much they cost in local language, but quickly switched to French. I had no idea how much they should cost or how many tomatoes was a sufficient amount (since I had never really bought any ever in my life and I didn’t know even what I would use them for), so I just gave her some money and took what she allowed me to. I felt pretty accomplished, I had just completed my first business transaction in my village (as a business volunteer, I had basically finished my job for the day). Growing more confident, I decided to walk down the main road and explore a bit more before heading back home. This was going to be all right I told myself, I was going to do well here. I turned around to start walking away from the tomato stall. But what I saw I was not prepared for, and instantly shattered all my new found confidence. A man was standing in the middle of the road and aiming a bow and arrow right directly at my chest, about to launch what would certainly be a deadly strike. My arrow missed his heart because, well, dolo might have had something to do with that, and I instead hit a tomato that he had placed on his head like he often saw small children doing around town to develop their skills. I never knew that Omar knew I was aiming at his chest. I just played it off like I had made an amazing shot at the tomato on his head, which is actually a fruit, technically.